Indeed it is. Obama's White House Attorney, Greg Craig, was a Mueller target. A Gateway Pundit report says he expects to be indicted for making false statements to investigators. Well, she obviously doesnt trust the plan. The book is a distraction - behold the hair apparent! 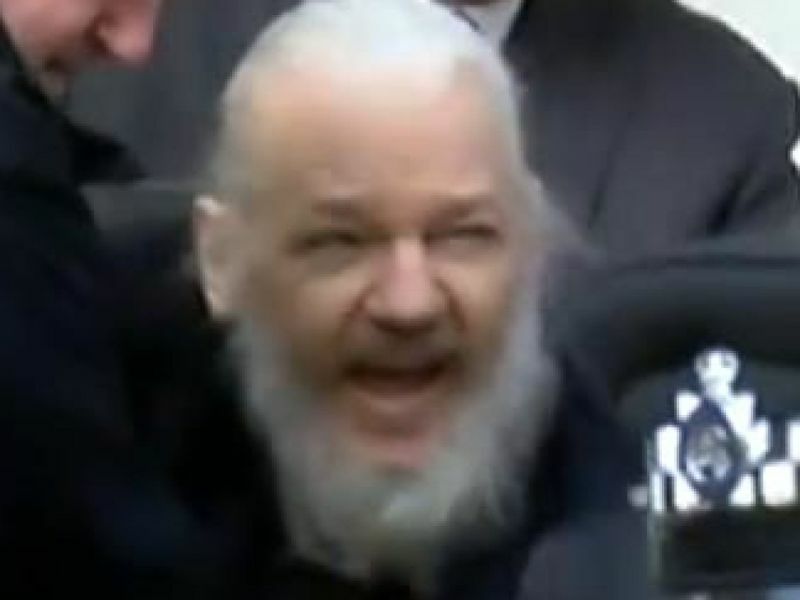 Assange now outwardly appears as the character he is; The Wizard. I'm going to research this and think about it, then make a decent post about it. I wish I could explain how crucial it is to fit the cast and characters into a familiar literary style. Definitely good to keep this in mind. I find it interesting that the indictment against Assange came roughly two days before the federal statue of limitaitons ran out, on March 6, 2018. Typically, the default statute of limitations for a federal crime that cannot result in the death penalty is 5 years, but the indictments, under 18 U.S.C. §§ 1030, extend the statute of limitaitons to 8 years. In the absence of a specific statute of limitations, the default federal limitations period of five years applies. See 18 U.S.C. § 3282. There are two exceptions to this five-year default limit: 18 U.S.C. §§ 1030(a)(1) and (a)(5) (A) (if the violation causes the type of damage identified in section 1030(c)(4)(A)(i)(II)-(IV)). These crimes are included in the list of offenses in 18 U.S.C. § 2332b(g)(5)(B) (acts of terrorism transcending national boundaries), which offenses are incorporated into 18 U.S.C. § 3286 (extending the statute of limitations for certain terrorism offenses). Section 3286 extends the statute of limitations for those crimes to eight years and eliminates it for offenses that resulted in, or created a foreseeable risk of, death or serious bodily injury to another person. And, I see that Pamela Anderson is out there making a lot of noise on twitter. Just remember, she is an actor. There's really NO logical reason the POTUS would be out to throw the book at JA in light of all we know so far. Pamela needs to cool her jets, Trump's base is on JA's side too ! I wonder what our friend Sky thinks about all this ? Hopefully this is all part of the " Show ".... but it's definitely disconcerting. APRIL SHOWERS, BRING MAY FLOWERS !! So Ervin Magic Johnson resigned from his Management position with the Los Angeles Lakers Basketball team. A curious thing, as there was zero advantage or need to do this prior to the off season. His explanation was incomplete at best - not that he needs to give one frankly. Look - here comes Loop Capital! According to sources, the winning consortium will have capital from JLC Loop Capital Partners, which is the infrastructure investment firm set up by the former Los Angeles Laker, Magic Johnson. He recently founded the company to take advantage of new federal government infrastructure spending promised by President Barack Obama. The firm raised over $1.3 billion in the first quarter of 2016, including $1 billion from a sole investor. Watch for resignations. Watch for connections revealed. Codesucq image link scroll down. That last part is crazy. He recently founded the company to take advantage of new federal government infrastructure spending promised by President Barack Obama. The firm raised over $1.3 billion in the first quarter of 2016, including $1 billion from a sole investor. Rich people start companies to take advantage of billions of dollars of government contracts. Thats how the rich just keep on getting richer. Magic Johnson is probably good friends with Obama and im sure his company was awarded some very lucrative contracts. Tony SCOTT, Ridley's brother, committed suicide by jumping off a bridge in Los Angeles. I remember when it happened and some of the controversy surrounding it. I think there was even a discussion here on ATS about it at some point. Seriously. Its just like Lord of the Rings. Gandolf (Julian, pre Embassy) is defeated and must go away, presumed dead. Then, against all odds. he returns as the resplendent White Wizard and leads the good guys to victory when all hope seemed lost.